Hi! Susie here today sharing the Magical Moments from the start of our day at the Epcot Center at Disney! Everybody stopped to snap pictures in front of that iconic globe with the magical wand and my family was no exception. We took a few versions - kids only, one with dad, one with mom - and I decided to include them all on this layout! 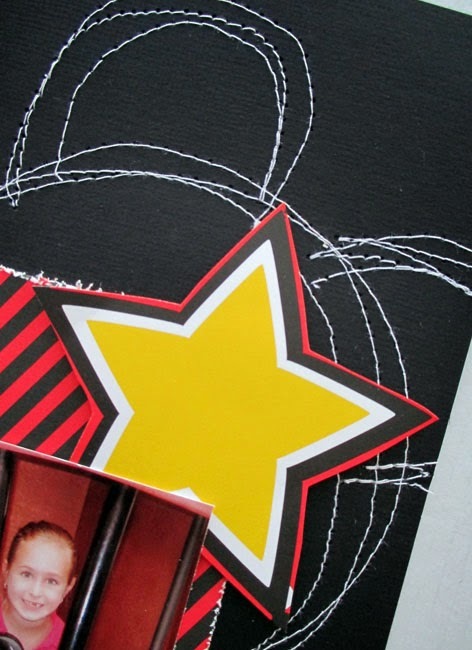 I matted the pictures and paper with black cardstock - it really makes the images pop off of busy backgrounds - like the star print paper. I love to mix patterns and matting the layers with cardstock really makes a difference. I did a few things to add a little dimension. I used a craft knife to cut around the bottom edge of the star. I placed a black rhinestone swirl over the printed swirls, and I added a little 3D mouse sticker! Welcome to the last day of our Magical Moments Inspiration week. Here is a reminder of what you might win!!! Susie here with a layout featuring a very special moment in our trip to Disney World: my daughter meeting Minnie Mouse! She was definitely our "Favorite Gal!" This collection has so many great patterns and I used quite a few of them here! I created a black mat for the red and white polka dot paper to make it pop off of the background. I double matted the pictures in white and black for the same reason. I used a die to cut a pocket to hold a bright yellow tag for journaling. Final touch is a little swirl of black bling. Visit all the posts this week to see our projects and leave comments each day for an entry. I hope you have enjoyed the projects this week! Come back in January when we will be highlighting the Soccer collection! Other products: Want2Scrap bling,Thickers, cardstock, baker's twine. Hi Moxxie fans! 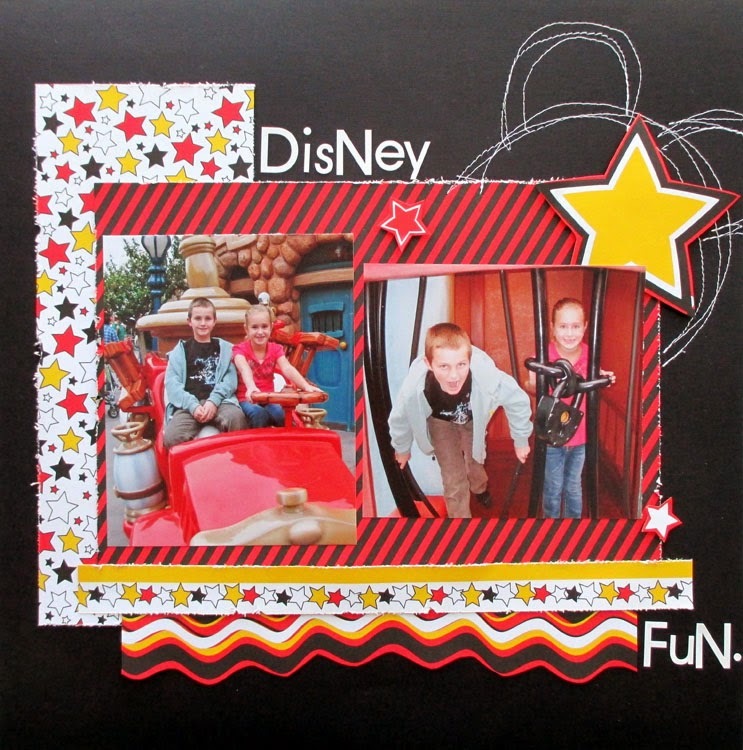 Dana here today sharing a layout I created with the NEW Magical Moments Collection. I took my daughters to Disney last fall and we had a fantastic time. We found this phone booth at Epcot and my daughter had no idea what it was, but she was more than happy to pose for some pictures! The B-sides to the patterned papers in this collection sport a fun printed border strip. I left the strip on the top of my page and added several Border Stickers underneath. These cardstock stickers are a wonderful alternative to patterned papers! 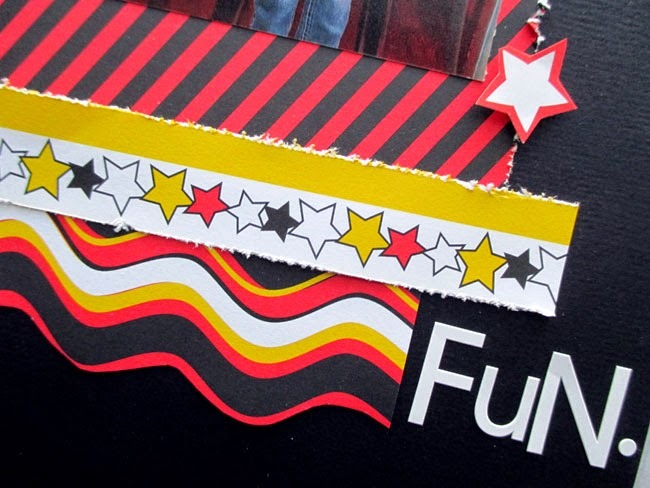 The adhesive backing and fun shapes of the Border Stickers make adding interesting designs to scrapbook pages quick and easy.